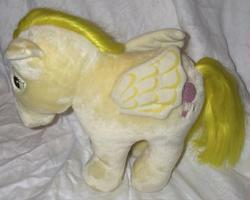 Lofty's Plush Paradise Softies Page- Featuring Hasbro Softies and other plush My Little Ponies! 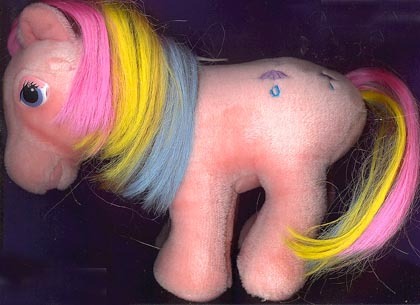 Hasbro Softies Hasbro Softies were made in 1984-1986. 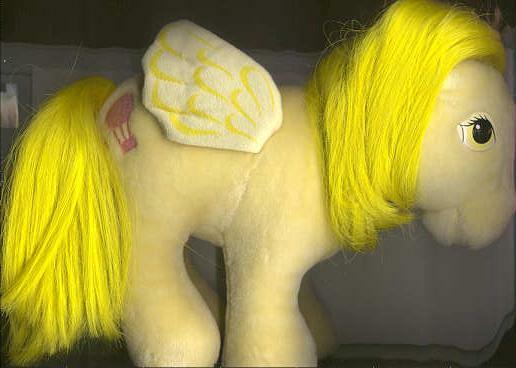 They are the Plush version of My Little Pony. 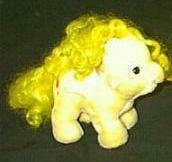 They are about 7 to 9 inches tall; plush with combable hair and plastic eyes. 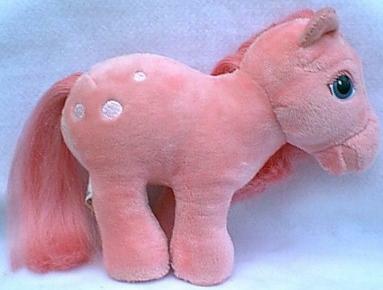 The following are all the US plushes. Applause also made a version that can be seen here. 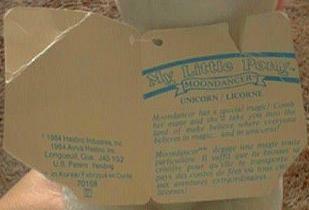 From the store they came in plastic bags with paper and tush tags. 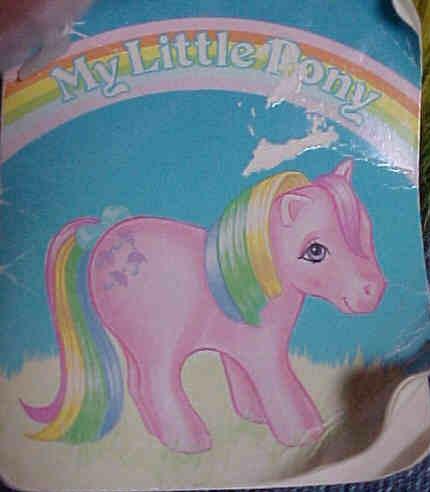 The paper tags had poems written on the inside right hand side. I will try to post all of the poems as I can get them. 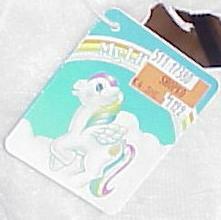 They are hard to find with these tags because many were ripped off. 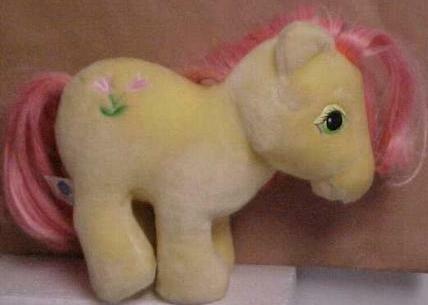 Also they each came with flower brushes. 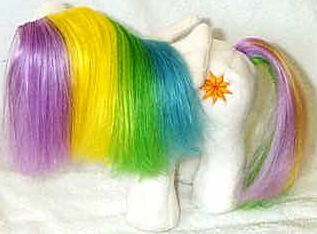 Different versions are available for Firefly, Glory, Moon dancer, Parasol, Starshine, and Windy. They have there head turned and mouth open. Diagram of the paper tag in English/French layout. There are also tags in just English. 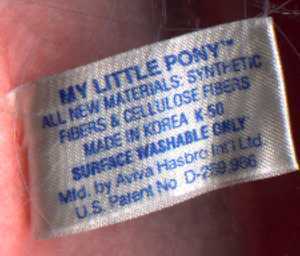 The text in the  vary depending on which pony the tag represents. 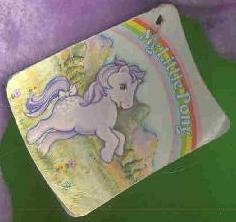 Example of Moondancer's paper tag in poor condition. 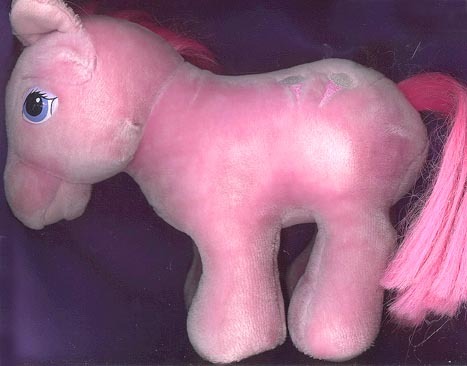 Cotton Candy is all pink. 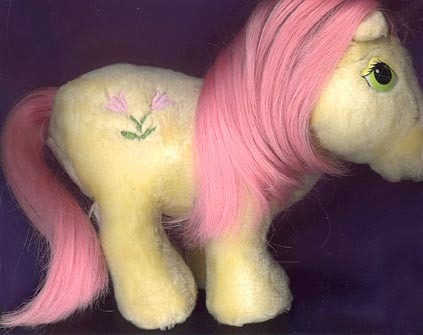 Blossom is all purple and came with a white flower brush. 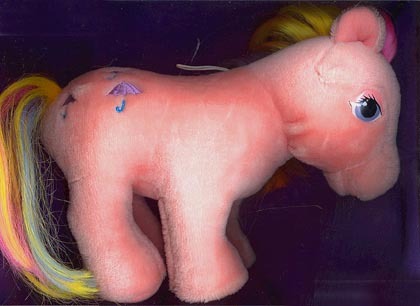 BowTie is blue with pink hair with three pink bows and came with a purple flower brush. 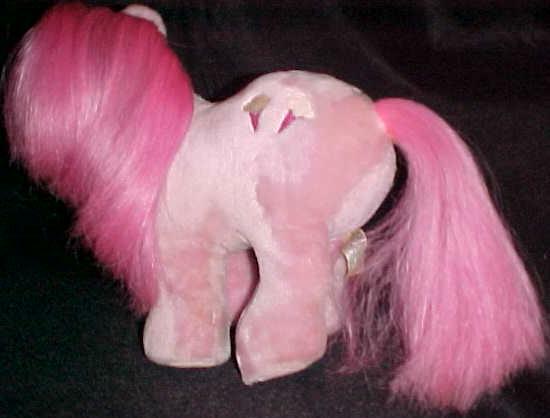 These three ponies are in the traditional standing pose. 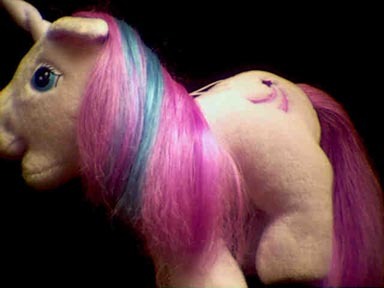 Firefly is pink with blue hair. 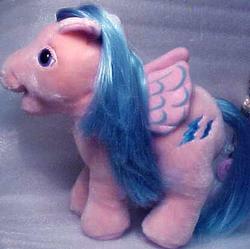 Like the little version, has two blue lightening bolts as her symbol. There are blue outlines on her wings and she is standing in the traditional pose..
Firefly loves magical adventures...chasing the clouds and sliding down the rainbow! But most of all she loves to have someone to care for her. 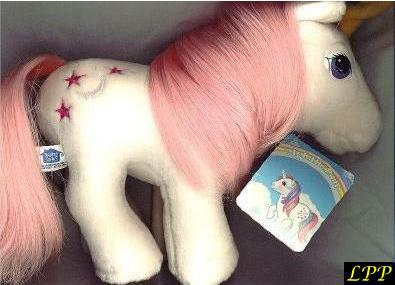 Someone to feed her and comb her mane and tail. How about you? 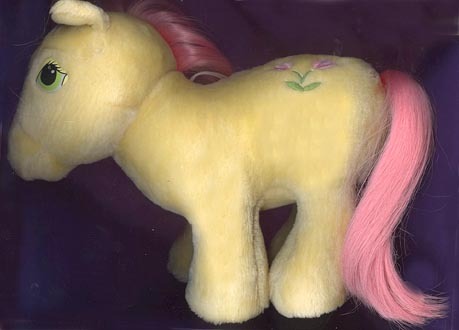 Moondancer is white, but with pink hair unlike the original MLP. 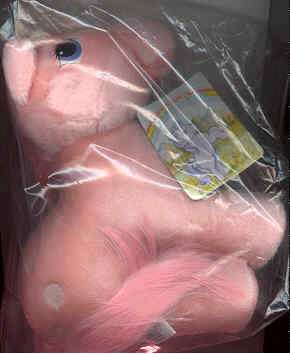 She came in 2 versions one with her mouth closed and open mouth. Pic Coming Soon! 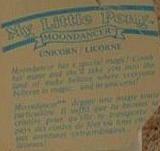 Poem:Moondancer has a special magic! 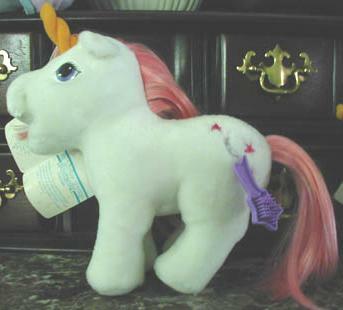 Comb her name and she'll take you into the land of make believe where everyone believes in magic.. and in unicorns. 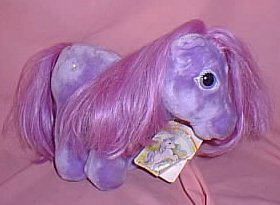 Glory has lavender hair with a blue streak in her mane. 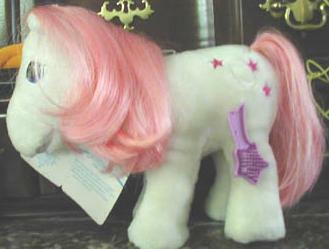 Her head is turned and her mouth is open. 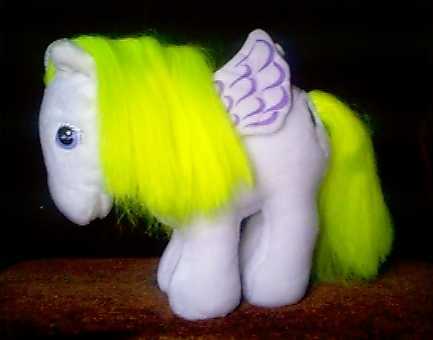 Starshine is white with rainbow hair and her symbol is a gold starburst. 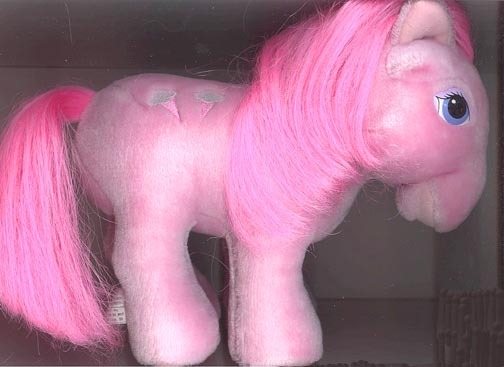 I have heard that there is another version of her with purple in her hair rather than pink. She has her head turned and her mouth open. Hello! 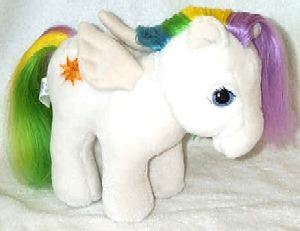 I'm Starshine a rainbow pegasus! I love adventures and making new friend. Please be my friend. 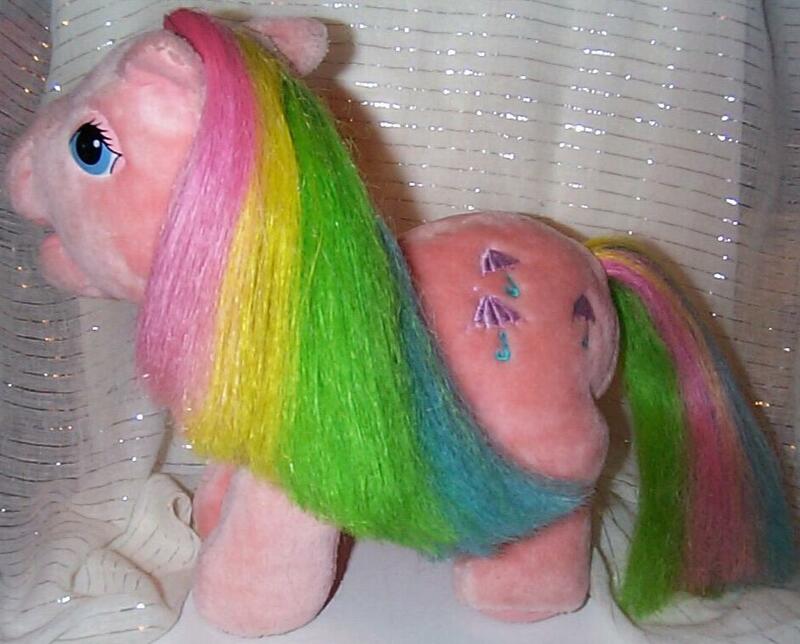 Will you comb and braid my long rainbow hair and tie it with a ribbon? 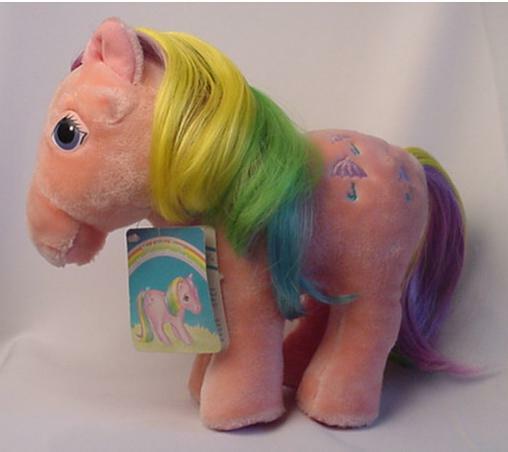 Windy is purple with rainbow hair. 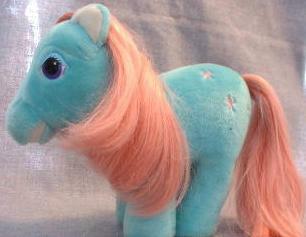 Hi there, I'm Windy! 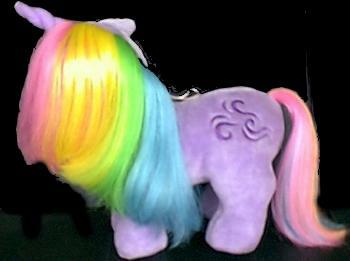 My horn gives me magical energy to be the fastest of all the Rainbow ponies. 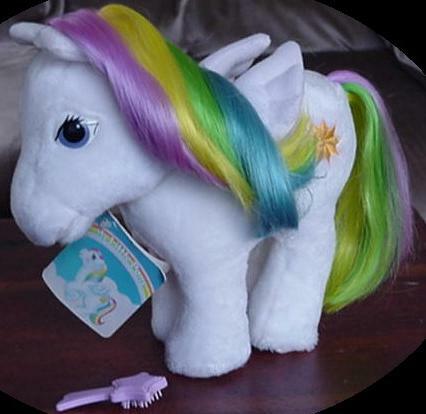 Will you be my friend and brush my long silky hair? 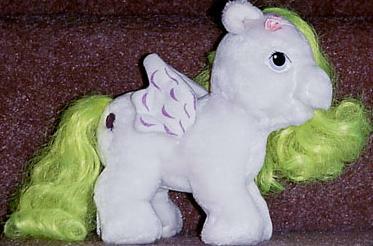 Parasol is pink with rainbow hair - however, two versions of her were made. 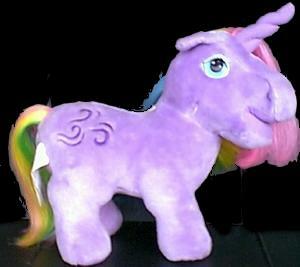 One is in the traditional standing pose with purple as one of the colors in her mane and the other had her head turned and her mouth open with traditional pink as the first color. Both are shown here. 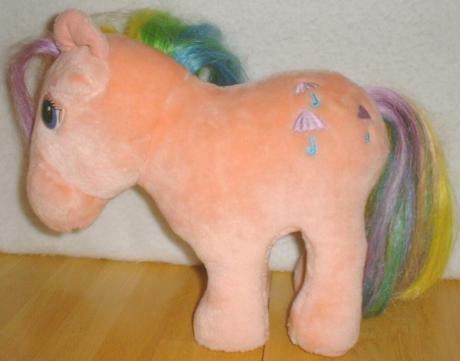 "Hi, I'm Parasol, a beautiful Rainbow Pony! 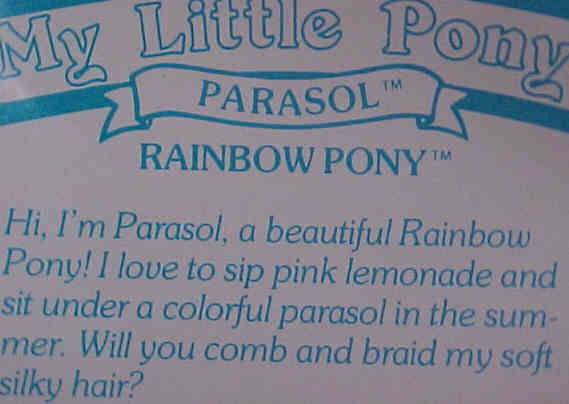 I love to sip lemonade and sit under a colorful parasol in the summer. 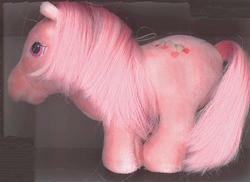 Will you comb and braid my soft silky hair?" 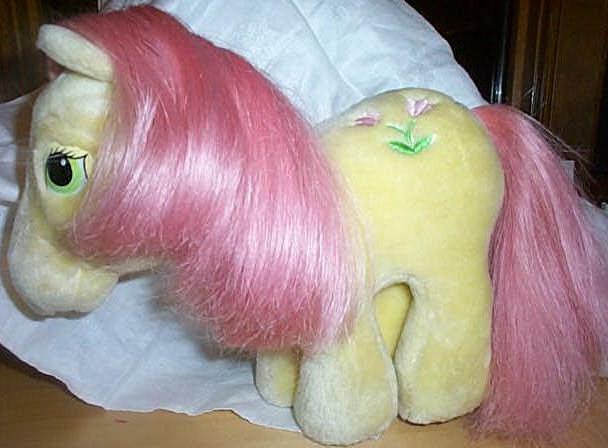 Posey is yellow with pink hair. 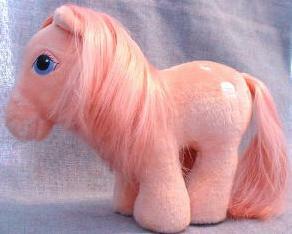 Cherries Jubilee is all peach. 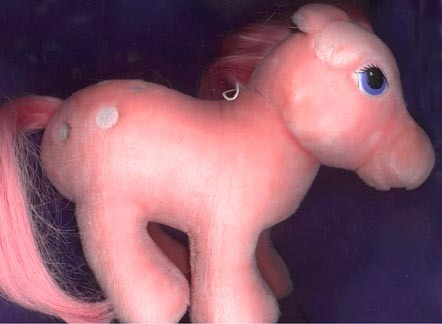 The main difference between her, and the little Cherries Jubilee, is that the plush one had dark pink eyes rather than green. 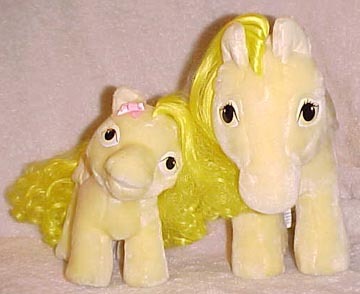 Both ponies are in the traditional standing pose. 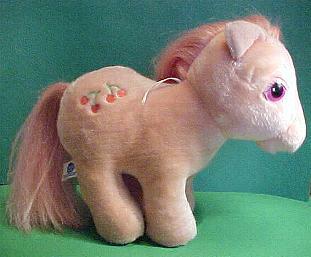 In Year 4, Mother and Baby sets came out and were the last plush ponies made. 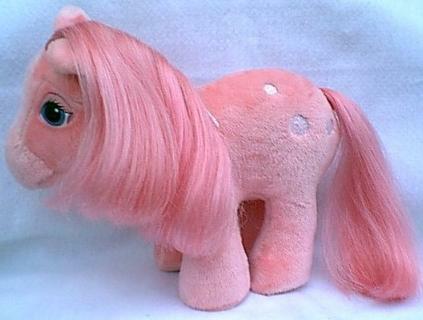 Lickety Split (1984) was the first, as she came out earlier without a baby. 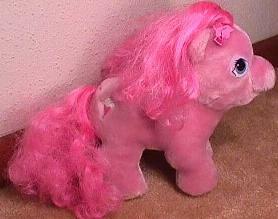 She is pink with dark pink hair. Baby Lickety Split came after the re-released Lickety Split. 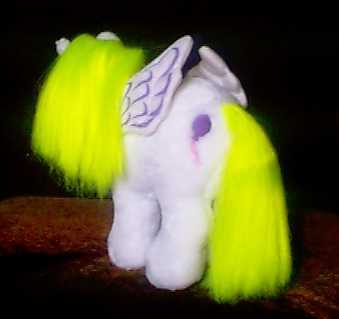 Surprise is white with chartreuse hair and her wings are outlined in purple. 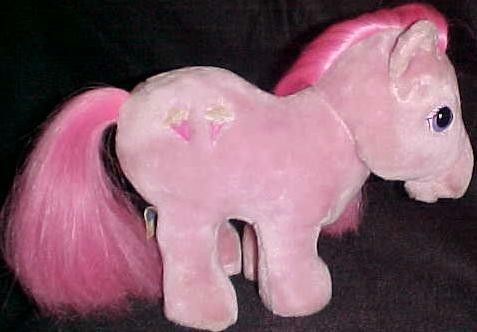 Baby Surprise looked the same only 7 inches instead of 9 inches, chartreuse hair, and has a pink bow under her right ear. 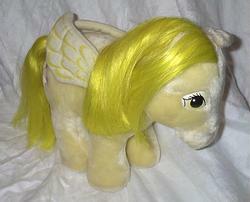 Lofty is all yellow including outlined wings. 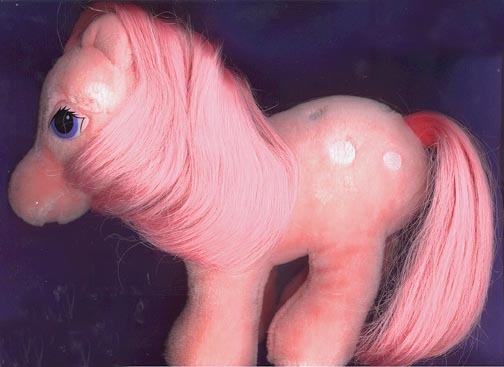 Baby Lofty looked the same only 7 inches instead of 9 inches, curly hair, and have a pink bow under their right ear.